Gone are the days where I can spend the whole of Saturday shopping and preparing for a dinner party. I used to have loads of them when I was a single girl, living in a share terrace house in Paddington in the Eastern suburbs of Sydney. They were big and often went on 'til the wee hours. Some marriages ultimately emerged between people who met at my dinner parties. About the biggest claim to fame, was that a friend once brought as her date, Tom Cruise's pilot. Tom used to be in Sydney alot when he was married to Nicole. He was a most ethical guest and never told us a thing about the happy couple. Smart man!!!! You would be a fool to blow off that job. Despite the revolving door of gorgeous young things, there was always one constant. The food was somewhat cutting edge. But to be honest, ingredients like lemon grass and tamarind paste don't really qualify in that category anymore. Whilst I've been working out how to raise kids over the last 10 or so years, the culinary scene has moved on big time. Nothing brought that home to me more last week, than mixing with the next generation of foodies in Noosa. That rude shock means I have returned home with a new spring in my step. I love the way getting out of a rut can do that for you. If you missed it, my New Years Resolution, was to take any opportunity which comes my way and cooking in Noosa was all about that. What has emerged from that trip, is so much more than loosing a cooking competition. It has inspired me to upscale it a bit. I still don't have time for the whole day dinner party prep. It still has to be a little bit easy, but I am stepping out of my comfort zone. Buying new ingredients, figuratively tossing it all up in the air and seeing what happens. So this week's new ingredient was Panko Crumbs. Yep, a little late to the party I know, but bare with me dear reader. I have a bit of catching up to do. This week I decided to use the Panko Crumbs in Neil Perry's Wonton bites. They were delicious and surprisingly easy. As he says in his tag line, once all the ingredients are ready to go (read sliced or minced) they are very easy to assemble. 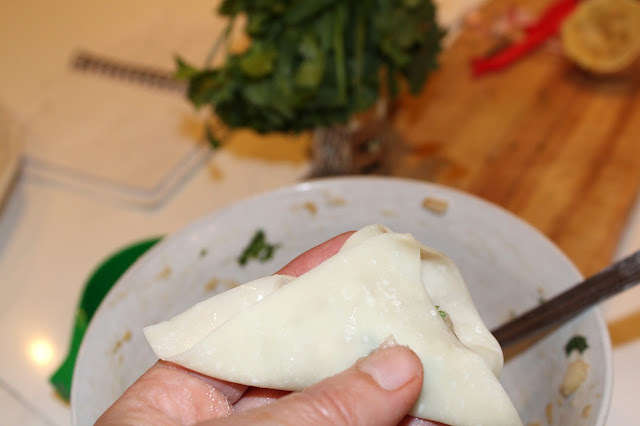 Even the little wonton parcels come together surprisingly well. Combine all ingredients for the wontons except the wonton wrappers and egg white. 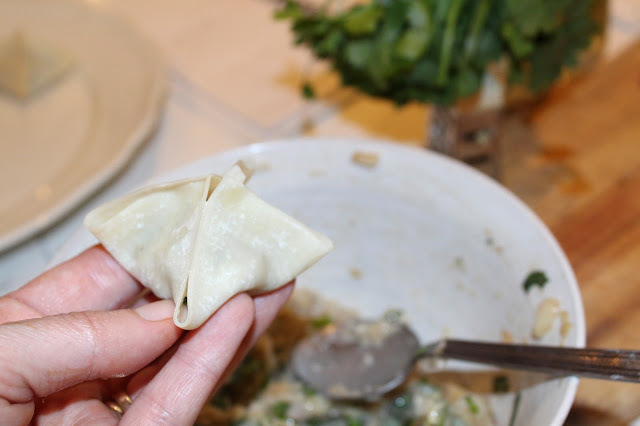 Take your wonton wrapper and place it on the palm of your hand. Brush it with egg white and place a heaped teaspoon of the filling in the centre of the pastry. Pull 2 corners of the square together to form a triangle. The egg wash allows you to slide the corners to fit together exactly. Pull the bottom 2 corners of the triangle up, one at a time, to form a pyramid shape. Slide them into position so there is a nice point at the top of your pyramid. Seal the edges by lightly pinching them between your thumb and forefinger. 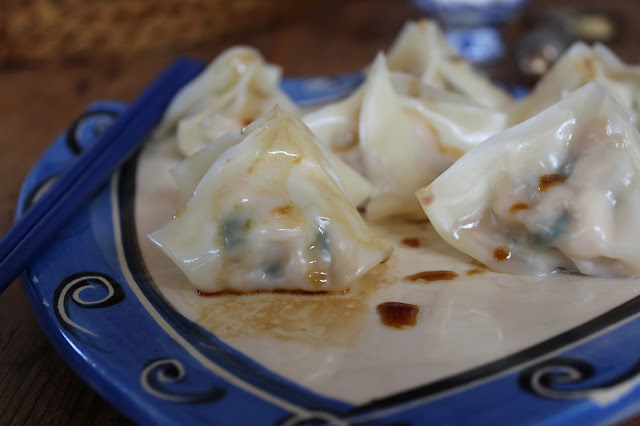 Steam in batches, making sure the wontons do not touch each other, in your steamer for 5 minutes or until translucent. Put all the ingredients into a jar and shake vigourously. 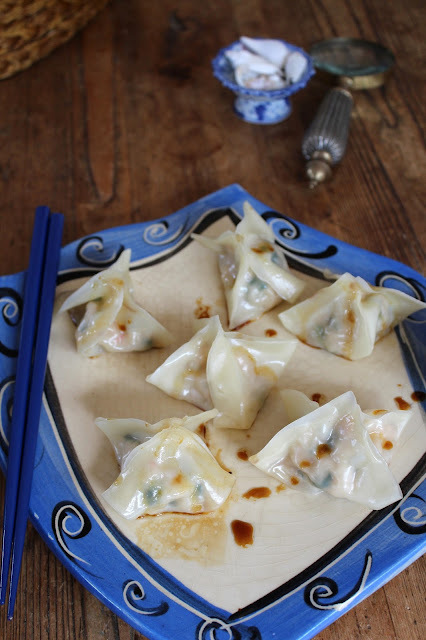 Serve in a small dish along with the wontons and also lightly drizzled over your wontons. 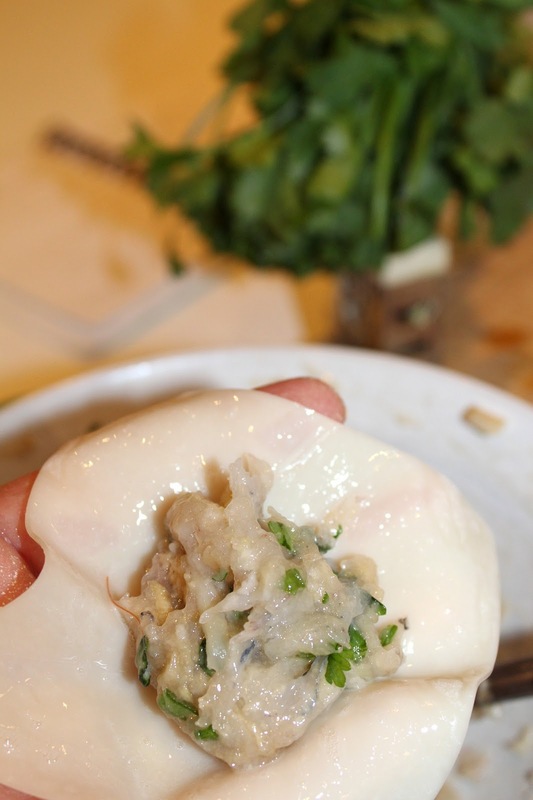 They have a beautiful texture, taste absolutely delicious and have a low ratio of effort to wow factor. Have a great weekend beach dwellers. I encourage you to give these lovely little morsels a go. When I lived alone in my flat, I used to cook proper meals just for me and eat them for lunch or dinner as left overs. I love food so much, that I think I will always do that. delightful! And I would never have thought to use panko crumbs in them = genius! oh yum! they look delicious. i spotted tom cruise a few times in rose bay when they lived here. I must do these for a dinner party. This recipe looks delicious, once I have my new kitchen installed I cant wait to get re-energised into cooking up a storm. 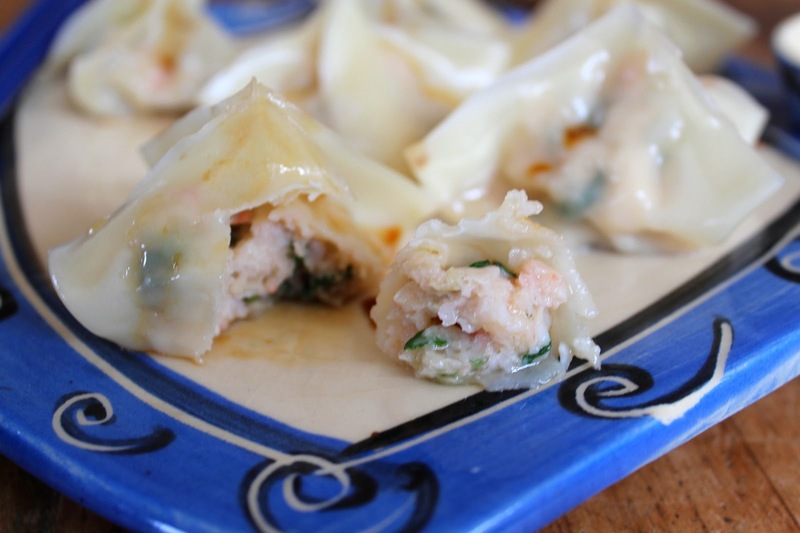 I did a post about my favourite seafood the other day and it was all about prawns - love them. 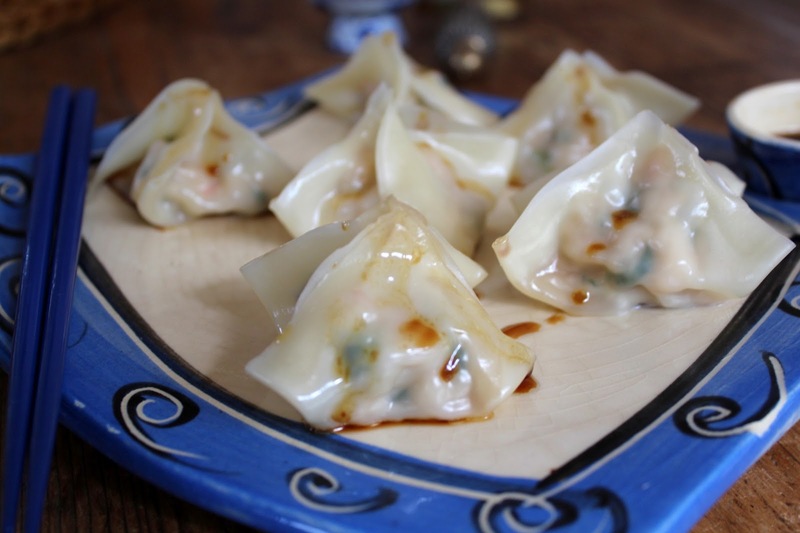 I love won tons and I am very tempted to do this but I will probably just save the dipping sauce recipe. I miss a wild and wonderful dinner party. I once fell in love with the bloke who brought profiteroles he'd made himself complete with whipped cream and chocolate sauce. Now what on earth happened to him? But I was always a simple cook... these look quite manageable... the hard bit would be getting anyone in my family to eat them! Fussy lot. Annoying! You make it look so easy - I think I must be due for a meal at your place! Yum. 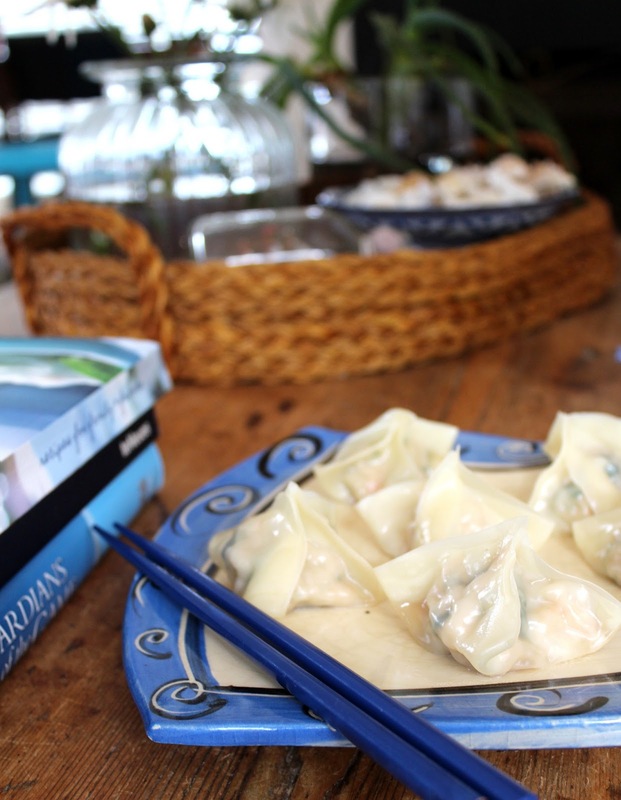 I eat prawn wontons all the time. Love your recipe.